The deep winter cold can invoke the desire to hibernate under the blankets, in the warm bath or to the rocking chair in front of the fire. To stoke my fires I am drawn to the warming kitchen sadhanas that blends the inner peace with the physical body. I reach for my grandmother’s molcajete and tejolote, a traditional Mexican version of the mortar and pestle. These have been used by the Aztecs and Mayans for thousands of years and are made from volcanic rock. 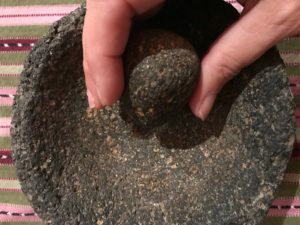 In Wise Earth Ayurveda we understand the significance of the Mortar as the representation of the Primordial Feminine Energy (SHAKTI) and the Pestle as the representation of the Primordial Masculine Energy (SHIVA) and grinding the seed which holds the cosmic memory of the plant for healing, melding together in balance with the SHIVA SHAKTI energies. 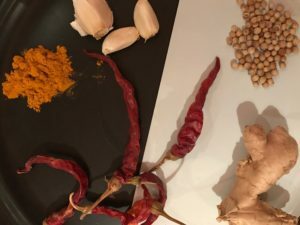 Melding the wet masala ingredients invokes the ancestral memories of my grandmothers while the fragrance of the ingredients warm my spirit and enliven my digestive agnis (fire). Peel the garlic and ginger, roast the coriander seeds, and grind all the ingredients together on a grinding stone. Use a half palmful of water to meld the ground ingredients. Add turmeric powder toward end of grinding. Use at once.